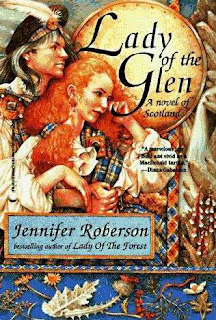 Jennifer Roberson's Lady of the Glen (originally titled Glen of Sorrows) is an historical novel about the Massacre of Glencoe, which occurred in the Scottish Highlands in the year 1692. Roberson is best known for her numerous fantasy novels in addition to few historical-fiction novels. Lady of the Glen opens in the summer of 1682, when an adventurous 10-year old Catriona "Cat" Campbell - the only woman in her family consisting of a father and several older brothers - meets Alasdair "Dair" Og MacDonald: archenemy of her family and clan. Although the two are supposedly destined to be enemies based on their family's rivalry toward one another, Cat and Dair's undeniable chemistry causes them to forge a curious bond that neither knows how to handle. As the years gradually pass, Cat and Dair continuously find themselves crossing paths as enemies; although their harbored feelings of passion for one another cause them to act otherwise. At long last, at the start of a major war, Cat and Dair finally confess their love for one another, but "happily ever after" must be forced to wait. Lady of the Glen is an epic novel, and reads perfectly for those who love to while away the hours ensconsing themselves in a beautifully written story that is easy to become lost in. I appreciate how the love story between Cat and Dair does not overpower the historical aspect of the novel in regards to the Massacre of Glencoe. Lady of the Glen is tastefully written and easy to devour; though for some, it may not be a novel meant for light-reading entertainment, especially when the war approaches and we are regaled with political themes and events that indirectly concern the fates of Cat and Dair. If you read and enjoyed the Outlander series by Diana Gabaldon, you will also enjoy Lady of the Glen, which is very similar, but without the time-travel aspect, of course. Both Cat and Dair are enthralling characters, plus, it may inspire you to read more about the Massacre of Glencoe when you have finished reading this novel. Jennifer Roberson's other historical novels include Lady of the Forest (1992) and Lady of Sherwood (1999), which both tell the story of Robin Hood. Roberson has also written the Cheysuli, Karavans, and Sword-Dancer fantasy series. Click on the pictures of Roberson's novels below to read about them in more detail on Amazon.com.